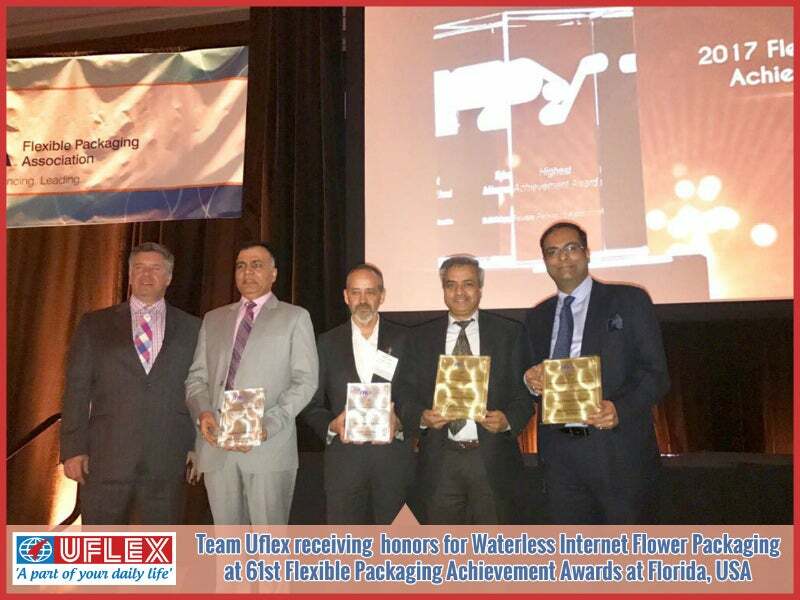 In a massive win, Waterless Internet Flower Packaging by India’s largest multinational flexible packaging materials and solution company Uflex Limited has been conferred with a series of top honours at the 61st Flexible Packaging Achievement Awards ceremony held in Boca Raton, Florida, US, this week. Annual Flexible Packaging Achievement Awards organized by Flexible Packaging Association (a prominent U.S. association of the manufacturers of flexible packaging; and, material or equipment suppliers to the industry) are considered as the be all and end all in flexible packaging. This year, 75 distinct packaging entries were in the fray, with a total of 152 entries cumulatively (some packages were entered for multiple categories). 19 packages were honoured with 29 Achievement Awards. Waterless Internet Flower Packaging works on the principle of Active Modified Atmospheric Packaging (AMAP) through Flexfresh™, a special patented polymeric film offering shelf-life extension solution for fresh fruits, vegetables and flowers. Uflex introduced this specialised packaging solution in India and internationally last year, which has been getting a positive response from the market. With the top accreditations coming in from none other than The Flexible Packaging Association itself, this biodegradable packaging solution is bound to get yet wider acceptance in the fresh-produce packaging industry. Expressing delight at this whopping feat, Mr Ashok Chaturvedi, chairman and managing director, Uflex Limited said: "Flexfresh™ impeccably upholds the ethos of Flexible Packaging through myriad sustainable advantages that it offers towards shelf life extension for Fresh Produce from a few days to several weeks. We have already tried and tested the efficacy of this packaging solution for fresh produce ranging from Iceberg Lettuce to Broccoli to Bell Peppers, Rambutan, Mangos to Blueberries and now to Flowers. Trials for several other categories are underway. "We are living in a world where almost one-third of the food (approximately 1.3 billion tonnes) produced for human consumption is wasted every year and millions of poor go hungry every day. A major portion of this wastage occurs due to flawed packaging. I am glad that the engineers at Uflex were able to perceive this need- gap and plugged it by developing Flexfresh™. I would like to thank the Esteemed Jury of Flexible Packaging Achievement Awards 2017 for assessing the true potential of Flexfresh™ and the mettle it beholds to bend the arc of the history to the best advantage of the poor."